Four empires from all over the world – and very different eras, but no one is counting – are in conflict. Not war, nothing as crude as that. It’s more like a friendly competition over who’s civilization is superior, and it’s mostly carried out by building your own empire to be as productive as possible, although plundering and sabotage are an option on occasion. That’s what happens in Imperial Settlers: colonists of the Roman, Egyptian, Japanese and Barbarian empires have arrived on a newly formed island at the same time, and they all try to get the most out of the new land. Imperial Settlers is a card game, but with a truck load of additional materials. 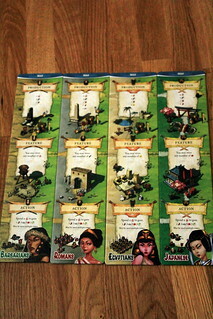 Each of the four empires have their own deck of cards, with buildings and other cultural accomplishments of that empire. Like ninjas. No pirates, though, sorry. Ignacy, if you make a pirate expansion for Imperial Settlers I promise I will buy it! Anyway, where was I? Oh yes, one deck of cards for each empire, plus a larger common deck with things they all used, like quarries and forests to cut wood from. It didn’t take a long and specific cultural history to figure those out. You start the game with two common cards and two of your own, and you will have five rounds to get as many of those cards as you can into play and use them to score points. Each round starts with picking up more cards, one of your own that you simply draw and two common cards that are drafted: put one more card open on the table than there are players, then each player starting with the current first player picks one, repeat but go backwards from the last player. Next you pick your production for this round: worker meeples, wood, stone, food, raze and defense tokens, and gold coins that can be used instead of stone, wood or food. At the start of the game, you don’t actually get much, and your first priority is to increase your production in order to afford more cards in order to increase your production – you get the idea. That’s what happens next, in the game’s main phase. In the main phase, players takes turns taking an action each, until all players have passed. Each action is very quick, and most of the time you can plan your move while the other players are taking their turns, so Imperial Settlers moves at a good pace. The most common actions play cards from your hand, either to build a location or to make a deal. To build a location, you pay its price – mostly wood and stone, but for your empire’s cards you often have to discard another location as part of the price – and put the card next to your player board. Congratulations, you are now the proud owner of a new quarry, farm, castle, … . Locations come in three categories. Production locations add to your production at the start of each round. You also get to take the goods produced once when you play the card, especially helpful in the first round with your meager starting resources. Action locations can be activated on a later turn simply by paying the price given in the card’s text and reaping the benefit. 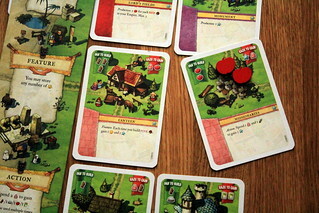 Many of them let you pay one type of resource to gain another – worker meeple for wood or stones, for instance – and some let you pay goods for victory points. Some action locations have more unique possibilities, often only available on one empire’s cards. The third type, Feature locations are less active, they mostly confer a benefit when you’re doing something else. Many of them let you take gold coins and victory points when building locations of the right color. The other way to play cards, by making a deal, is even simpler. You pay one food and put the card under the deals part of your player board, where it adds to your production. Instead of playing cards, you have some other options what to do on your turn as well. As mentioned above, you can activate an action card by playing the required resources on it. Another option, you can trade two workers for one resource or one card, either from your empire’s deck or the common one. The final thing to on your turn is where Imperial Settlers gets a bit violent. You can pay your sword-shaped raze tokens to raze a card and win resources for it. The nice way to do this is to raze a card from your hand. To do that, you pay one raze token, discard the card and take the resources won. But you can raze other players’ locations as well, if you’re feeling less nice or really need the resources gained from that specific card. Doing so is more expensive and costs two raze tokens, plus one more if the card’s owner has his defense token on that card. There’s a very good balance there: you can attack your opponents, but it’s usually less profitable for you to do so since you can raze two cards from your hand for the same price. Unless, you lack hand cards, then you just get on your ponies and invade the neighbors for their goods. It’s traditional. Or, of course, if an opponent is pulling ahead in points and needs to be stopped, a little sabotage is in order then, and taking the right card out of their production chain is often all it takes to stop them. You can generally only raze common cards, empire cards are immune to razing. Except for the Japanese ones, Japanese cards can be razed for a victory point each. 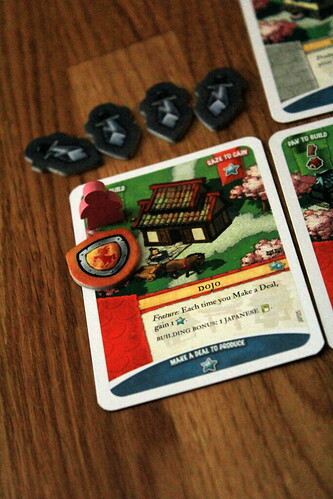 To defend against this disadvantage, they can use workers as samuraiple which have the same effect as a defense token. So, while you can raze Japanese empire cards, it’s generally going to be expensive. Other empires’ cards can still be destroyed, by the way, there are action cards that let you destroy any card you want. They just cannot be razed for their raze bonus. The Trade Route is one little flaw in the rules and it’s not obvious how it works. When you use it to make a deal with another player’s location, you place a random card from the Japanese deck under the chosen location. From then on, the goods provided by a deal with that card are added to the Japanese player’s production. The owner of the card does not profit from the deal. The Japaneses razeability is not the only difference between the four empires, each empire deck has completely different cards giving them different play styles. The Japanese are keen traders as well, some of their action cards let them make deals with other players’ location. That’s actually one weak spot we noticed in the otherwise great rulebook and card texts, so see the sidebar about how the Japanese Trade Routes work. Egyptians are simply rich, they have many ways to produce gold coins, giving them great flexibility. They actually tear down their pyramids for gold and stones, by the way. The Barbarians, to no one’s surprise, raze and plunder. They can earn bonus points from razing cards, steal resources from other players and generally make themselves unpopular. The Romans, finally, are a bit more organized than everyone else. All other empires can only carry one type of resource into the next round, all others are discarded between rounds, but the Romans can store different resources in their warehouse. They also profit more from features triggered by cards of a certain color, because the Roman trade colonies are the only cards with more than one color, triggering multiple features at once. Even if the differences sound minor, the four empires play very differently, and you really should have a good look at the cards before playing a new empire for the first time. You won’t manage to draw all the cards during one game, but having an idea what might come up helps you plan and collect the right resources in preparation. Despite their differences, the four empires are well balanced and none of them stand out as more powerful than the rest. As with all games where you draw cards, there is an element of luck in Imperial Settlers. If you don’t draw the cards you need, you’re obviously going to have a harder time. That is mitigated somewhat by drafting the common cards instead of just drawing them. Production cards mainly come from the common deck and you have a chance to pick what you need, but it might still not be available, or be grabbed from under your nose. Most games are decided by having the better strategy, but luck does occasionally have a hand. Many boardgames are described as “engine building games”: you produce resources, with those resources you create other resources, with those you do something else, and in the end, your little engine spits out victory points, and the player with the best engine wins. 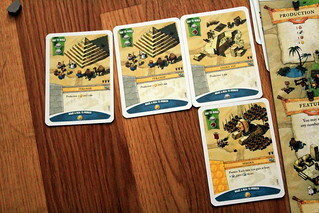 Imperial Settlers exemplifies this style of game. From the first move on, you build and tune your little engine and make it produce as many points as you can. Chaining the right cards together, playing them in the right order, glancing over at your opponents’ empires every now and then to sometimes, rarely, throw a spanner in their works. It all works very well, and even attacking the other players every now and then doesn’t reduce the fun, it just adds a bit of interaction and unpredictability. Also, Imperial Settlers has an almost perfect escalation curve. You start the first round with few resources and augment them a little with deals and new production cards. But with each round, you’ll have more resources to play with, can get more new cards into play, use more actions, it’s immensely satisfying to see your little victory point engine rev up like that. Add the adorable design with potato-nosed settlers, and Imperial Settlers is yet another game by Ignacy Trzewicek that I’ll be playing for a long time after this review.